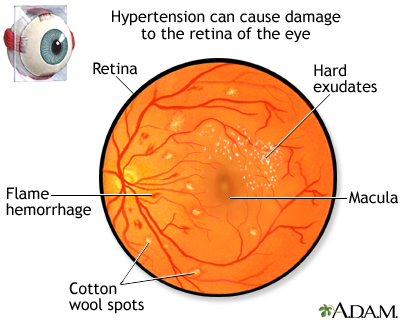 Damage to the retina from high blood pressure is called hypertensive retinopathy. It occurs as the existing high blood pressure causes changes to the microvasculature of the retina. Some of the first findings in the disease are flame hemorrhages and cotton wool spots. As hypertensive retinopathy progresses, hard exudates can appear around the macula along with swelling of the macula and the optic nerve, causing impairment of vision. In severe cases permanent damage to the optic nerve or macula can occur.